Hotter ball speeds launch shots higher and farther, allowing you to stop the ball quickly on the green. Maraging Steel Face: Extremely thin and even more flexible, the innovative maraging steel face generates faster ball speeds to launch shots farther, higher, and straighter. Thinnest Crown: The 17-4 SS crown is cast ultra-thin for weight savings to optimize the CG location and increase total MOI (high-low, heel-toe) for full-face forgiveness. Machined Back Weight: The machined back weight is more dense to increase total MOI for extreme forgiveness with maximum stability. Reduced Spin: The face texture reduces spin, and the head's cascading sole increases face flexing for higher launch. Arrived filthy/direct off a muddy course! 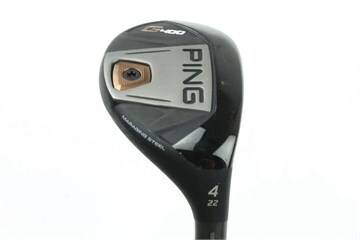 My review isn’t in connection with the quality/manufacture of a golf club, it is simply to do with the service from golf bidder. This club arrived as though it had come straight off a muddy golf course that morning, filthy and I feel for the price I paid that is unacceptable. Added this to the bag in place of a 5 iron. An excellent choice, great loft and distance which I couldn’t achieve before. Club arrived after 2 days(I live in the NE of Scotland), excellent condition, it looks brand new not second hand. Very pleased with both club and service.